The E1 mechanism is similar to E2 in that you get an elimination product, but the path to get there is completely different. It’s important that we understand how it’s different from E2. Concept #1: Drawing the E1 Mechanism. So now I want to talk about a mechanism that competes directly with the SN1 mechanism and that's called the E1 elimination mechanism. If I were to sum up the entire mechanism into one sentence, what I would say is this E1 occurs when a weak nucleophile reacts with an inaccessible leaving group. So let's just start right there. Do you guys remember another mechanism that we talked about that had similar conditions? Yeah, right? The SN1. Let's talk about the nucleophile part first. We said that SN1 is favored with what type of nucleophiles, strong or weak? Well, remember that strong favored the SN2 and E2, so weak is going to favor SN1 and E1. Why? Because remember that SN1 – I'm sorry, remember that a weak nucleophile would not start the back side attack first. It would wait for something to happen. Remember that the weak nucleophile just kind of was chilling and sitting back and waiting for something to happen. Well, then what's the other condition? The other condition says that it's with an inaccessible leaving group. Inaccessible really is just another word for tertiary. It's basically, there's many R groups as possible. Why is that good? Well, the reason that's good is because remember that tertiary alkyl halides would make really good carbocations. And remember that carbocation was the rate determining step for SN1. Is this all kind of coming back to you guys? Well, it turns out that the same condition is also good for E1. E1 also like to have an inaccessible leaving group. So if we have the same exact conditions that are good for both mechanisms, how do we know when one is going to happen or the other is going to happen? It turns out, we don't. So it turns out that these same exact conditions are going to also produce beta-elimination in two steps. What that means is that what we're going to find out is that SN1 and E1 always compete with each other. And they're almost impossible to separate. What that means is that every time you see an SN1 reaction, remember I taught you SN1, E1 is also occurring and you really can't do much to stop it. That's one of the messy things about these reactions is that they're often going to lead to a mixture of products and synthetically that's not very useful for us. When I say synthetically, that's a word I'll use a lot more later as we get into orgo two. Synthesis is a huge end goal of organic chemistry. Eventually, what you're going to be doing, get excited, you're going to be trying to synthesize a target compound. You're professor's just going to be like, “Hey, make this.” and you're just going to have a list of reagents and you're going to have to put them together. SN1 and E1 aren't very helpful for synthesis. The reason is because you get a mixture of products and that's bad because then you don't know exactly what you're getting at the end. Let's just go ahead and talk about this mechanism and see how you could get the SN1 or the E1. Here I've got, as you'll see, a tertiary alkyl halide. And the first step is going to be the same identical for both of these reactions. So what's that first step? Can you guys tell me? Is it back side attack? No. Why? Because my nucleophile isn't strong, so it can't initiate anything. Remember it's not one of those arrows. It doesn't do that. So it's just going to wait around. What actually happens is that the leaving group leaves by itself. Remember that part? It's kind of weird, but it dissociates. What that's going to do is it's going to give me an intermediate that looks like this. Single bond. H's are exactly the same, H, H, H. But now what I have is a carbocation. That carbocation came from the fact that the X just left by itself without getting anything in return, so electrons are leaving. Then finally, see how I have R1 and R2, those would still be here as well. So I'd have R1 and R2. Cool? So it doesn't matter which one you put where because this is a carbocation, so you don't actually know what you would get. So now what? Well, it turns out that this carbocation is going to do what next? The nucleophile is going to react with it, right? Cool. So my nucleophile would want to react with it. And the first thing you would think is that the nucleophile has electrons to give away. Remember it doesn't have a negative charge, but it does have a lone pair, so it could attack directly my carbocation. And it turns out that that is going to happen. That nucleophile is going to directly attack that carbocation and that's called the SN1 mechanism. So what we would do here is we would draw the SN1 product and the SN1 product would just be that I have now two R groups again and I would have these H's are exactly the same, but then I would get a nucleophile attached to wherever that carbon was. Now notice that I had R1 and R2, so those are different. Does this make a chiral center? Yes, most likely it does. So what that means is that remember that I would actually get two different products. I would get one enantiomer and then I would also get another enantiomer. Well, let's say that this R1 was faced towards the front and this R2 is faced towards the back. I would also get the other enantiomer where I have the nucleophile facing the same way, but now I have R2 in the front and R1 in the back. Is that making sense? I'm just going to leave this as CH3. So remember that whenever you make a chiral center, you have racemization. That means you get 50% of each and that's exactly what you would get for an SN1. But now we know that's not the only thing that's going to take place. There's also another mechanism that's going to compete with this and that's the E1. What the E1's going to do is it's going to say, you know what, I could attack the carbocation directly, but that's too boring. Why would I want to do that? Actually, I don't know exactly why it doesn't. But it's also going to say, you know what, I am a pretty good nucleophile, but I could also act like a base. And what bases do is they pull off protons. Remember that nucleophiles and bases many times are similar. So it's going to say well, let me just pull off a beta-proton and then once I pull off that beta proton, I can put these electrons into that bond there and satisfy the carbocation. This is also going to happen and that's called the E1 mechanism. So it's going to be competing with the SN1 at the same time. So what that means is that now what we're going to get is a double bond that has H's. Now only two H's, not three, only two. But now it has a double bond. Does that make sense guys? So we would not only have two different substitution products because of the racemic part, but we would also have an elimination product as well. On top of that, remember that elimination products may yield several products. In this case, I would only have one because I only drew one set of beta-hydrogens. But if I had more beta-hydrogens, I could react with all of those. So one of the reasons that this is so messy is because you have the possibility for up to five different products at times because you could sometimes get two different substitutions and then three different eliminations depending on what your leaving group looks like. And for synthesis that's really bad because the last thing a researcher wants to do is to separate a bunch of molecules that are very similar. They're going to be very difficult to separate from each other. And the really last thing that you want to do is try to make a target drug or a target molecule and then have other things mixed inside. Imagine if you were buying some pills from Walgreen's and the chemist was lazy and he decided to include enantiomers in there or decided to include other types of double bonds, you could die. So that's why you have to be very careful when you're doing synthesis to only get one product and that's not what we're doing here. 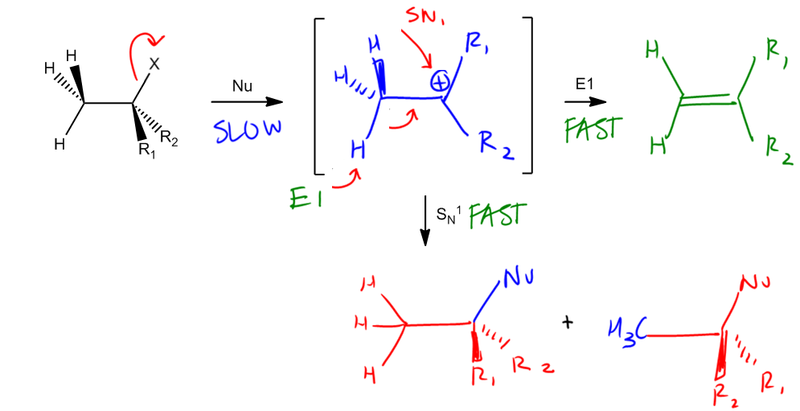 Summary: A neutral nucleophile reacts with an inaccessible leaving group to produce elimination in two-steps. Concept #2: Understanding the properties of E1. So now you guys know to expect SN1 and E1 at the same time. Let's just go ahead and fill out some really quick facts about this and I expect this part to be really easy for you guys because we've already done this for SN1. It turns out that the 1 in E1 stands for the same thing. E1 stands for elimination unimolecular. That means that in terms of rate kinetics, everything is going to be very similar. So do I want a strong or a weak? I want a weak because I don't want to do – I don't want the nucleophile to attack first. I want to make my leaving group. Is my leaving group substituted, highly substituted or unsubstituted? Highly substituted because this is going to make good carbocations. That's what I want. My reaction coordinate would be an intermediate, not a transition state because intermediates – carbocations are intermediates. This would be a two-step reaction because I have a slow step and a fast step. What's my slow step? My slow step, just so you guys, know right here, that's my slow step. And then my fast step is once I've made that carbocation, I could either attack it directly with an SN1 or I could do a beta-elimination with an E1, but regardless both of those are fast steps because once a carbocation is made, it's very, very easy to attack it. Cool. Then a little bit more. The rates, as I told you guys, would be unimolecular. What does that mean? Do you guys remember? It's the same thing that I made in SN1. What that means is that if I increase the amount of nucleophile, let's say I have ten times the amount of nucleophile, will that increase the rate of my reaction? No, because it's like I said with that analogy, where the factory makes carbocations one at a time and then there's like tons of boxes just laying around that someone's packing, like making boxes. In order to ship the product, I don't need more boxes, I need more carbocations. If I were to double the amount of boxes that I have, I'm still not going to have more products to ship out. And it's the same thing with this, the only thing that changes the rate is how fast I can make carbocations, which that's going to be the leaving group, not the nucleophile. So that means that my rate is going to be just the leaving group. Then finally, the stereochemistry is going to be – I'm just going to put here doesn't matter. Remember that – oops that's ugly. Remember that you had anti-coplanar for E2. Anti-coplanar does not apply for E1. Why? Because remember that for E2, my leaving group was still attached and then I had a beta-hydrogen. But in E1, guess where my leaving group is? It's out in solution. It already dissociated because remember you made a positive charge. And that positive charge it doesn't matter where it gets attacked from. It doesn't have any stereochemistry that it needs, so you don't worry about anti-coplanar. So if you want even to be more clear, let's put no anti-coplanar. So I hope that makes sense to you guys now. Now you know that your mind is filled with a bunch of mechanisms so we're going to do some practice of this and then later on, obviously, I have to teach you guys when do you use which mechanism and that's going to be the whole purpose behind this awesome flow chart that I'm going to show you guys at the end of today's lesson. So let's go ahead and move on to the next video. Which of the following shows the first step for an E1 reaction? Which equation corresponds to the overall reaction for which steps 1 and 2 describe the mechanism? What best describes the species at the rate-determining transition state? Which of the following shows part of the mechanism for an E1 elimination? Provide the mechanism for the following reaction. Be sure to include all intermediates, formal charges and arrows depicting electron movement. Predict the product and draw the full arrow-pushing mechanism of this reaction. Create the full arrow pushing mechanism which shows all intermediates and all products that result from these reactions. If alkenes are produced, indicate which is major and minor. Answer each of the following questions dealing with the given alkyl halides. Which compound cannot under an E1 reaction? Answer each of the following questions dealing with the given alkyl halides. Which compound will undergo an E1 reaction to form a tetrasubstituted alkene, but undergoes an E2 reaction to form a trisubstituted alkene? For the transition state structure below, choose an organic reaction in which it is involved and give a chemical equation for your selected organic reaction that includes the following: (i) structural formula(s) for the organic reactant(s); be sure to show stereochemistry appropriately when necessary (ii) the experimental conditions (Give structural formulas for organic compounds. Give a chemical formula or inorganic reactants or catalysts . If heat and/or light is needed, be sure to indicate it appropriately.) (iii) structural formula(s) for the major organic product(s); be sure to show stereochemistry appropriately when necessary. As we do for most organic reaction equations, the chemical equations that you give do not need to be balanced. Draw the final product for the following E1 reactions. Which of the following alkyl halides undergoes E1 reactions with the fastest rate? Provide the major product for the following compound. Consider the following pair of reactions. Predict the type of elimination mechanism, predict which reaction of the pair will occur at the fastest rate, and draw the correct organic product. Consider the following pair of reactions. Predict the type of elimination mechanism, predict which reaction of the pair will occur at the fastest rate, and draw the correct organic product. Assume the same solvent is used in both reactions. Give the mechanism of the reaction shown below.